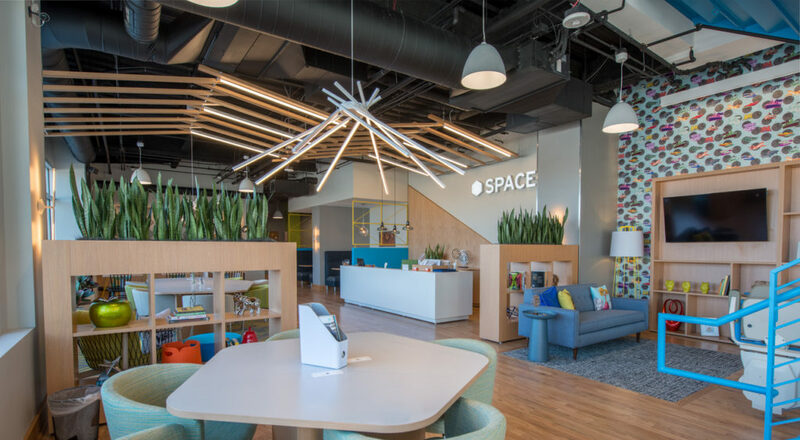 SPACES., a co-working office concept from Regus Office, has now opened two full floors (nearly 30,000 sq ft) at 8181 Arista Place. The new location is 25% larger than its previous and more traditional Regus location, and is currently 80% leased. Highlights of the more modern 8181 Arista Place include: a ground floor entry, meeting rooms, outdoors patios, internal connecting staircase, and a 5th floor balcony and rooftop deck. The modern and welcoming entry to the new SPACES. location at ARISTA. The recently completed 90,000 sf spec mixed-use office building at 8181 Arista Place provides additional Class A space within the unique transit-oriented development of ARISTA. After an impressive interior buildout the location has quickly become the new home to not only SPACES., but SPOTX, SPENGA, and Denver Restorative Dentistry. “Arista continues its momentum, and keeps welcoming new businesses, retailers, chef-driven restaurants and residents. It’s a pleasure to add a company the caliber of Regus SPACES. to our roster of companies. 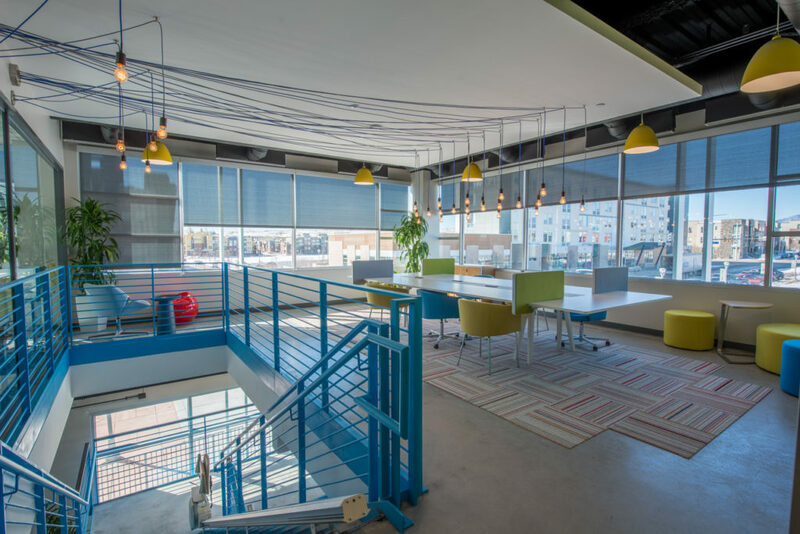 SPACES., co-working business model brings in more small-medium sized businesses to the fast growing Arista development,” said Joe Zepeda, Sr. Project Manager at Arista. Spaces, an established co-working brand with 20 locations in North America. Spaces creates an inspiring environment where people can work, meet with clients, network at one of the many organized events, enjoy a really good cup of coffee or a business lunch and where high-speed secured internet is ensured. We provide a wide variety of services so people can focus on getting down to business. After launching a location near Coors Field last February, the company opened two more Colorado Spaces in December. Spaces Arista, 8181 Arista Place, began welcoming tenants to its 30,000 square feet along U.S. 36 in Broomfield on December 20th, and Spaces Old Town, a roughly 14,400-square-foot cousin at 242 Linden St. in Fort Collins, followed on December 29th. 8181 Arista Place is located along Arista’s main street “Arista Place”, and is looking forward to welcoming more chef-driven restaurant and retail tenants with Class A office space above. It provides easy, walkable access to the adjacent RTD transit stop and covered parking in the Parkade. Based on the ongoing success of 8001 and 8181 Arista Place, concept plans are already underway for a third Arista Place office building. Arista is centrally located in the US HWY 36 Creative Corridor of the Denver Metro area. Arista is home to a full spectrum of businesses from high tech to healthcare as well as urban living with immediate proximity to transit, food and entertainment. Arista’s master planned design, nearby attractions, and pristine mountain views provide the perfect combination for live, work, play, shop, dine, stay AND transit.